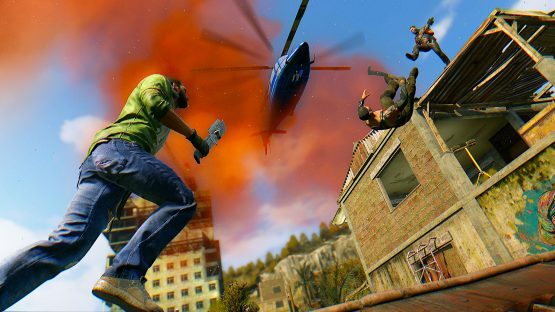 During GDC 2018 I was invited behind closed doors to take on some of the developers in their upcoming stand alone expansion Dying Light: Bad Blood, and this battle royale takes you from zero to crazy in a short amount of time. Each round consists of up to 8 players, randomly dropped onto an open world map, each tasked with gathering enough blood samples from dead zombies to fill up their blood meter, and then summon the extraction chopper. Sounds simple enough, but don’t expect an easy win. The game started out by putting us in a staging area where we could find weapons and attack each other, but this was just a staging area and had no relevancy to the upcoming match. You could grab hammers, machetes, and pipes and such, and even bash each other on the head, but it was just a warm up session while waiting for all players to get ready. Once you are actually dropped into the match, any weapons you may have picked up are gone and you’ll start out unarmed and unscathed, ready to scavenge and hunt. Each round stated out pretty slowly, as I had to hunt for weapons and avoid those pesky, run of the mill, zombies. 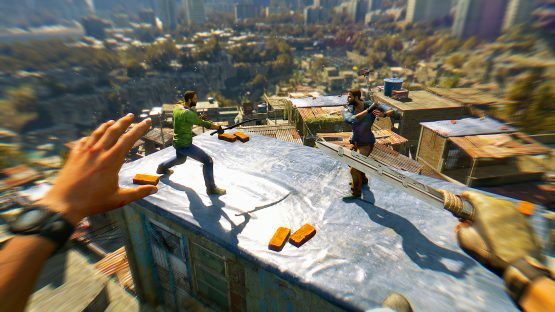 Fans of Dying Light—and there are still many—will instantly recognize the Dying Light game world and the controls came back to me pretty quick. Clicking L3 showed me there was a gold weapons box nearby, so I scaled a building and found a nice baseball bat with some nails protruding from it. I also found some grenades and a couple of Molotov cocktails along with a medkit so I proceeded to head to the nearest hive to start harvesting some much needed blood samples. Most zombies in a match will give you zero blood samples, so just randomly killing any and all zombies is almost a waste of time. You do earn XP for each kill, and there are a few advantages to ranking up, but I only played a couple of rounds so my main goal was to find the bigger, badder beasts in order to gather those samples. Hives are marked on the map for you, so all I had to do was head towards one, once I felt I had enough items in my arsenal. Toss a couple of grenades, cook off a molotov, harvest my first sample, and fill up my blood meter. As I headed to the next hive I came across another player who was in the process of taking down a big guy. I waited until he finished him off, and fed that player my last grenade, which weakened him enough that I was able to bash his head in with one swing of my bat. I gathered up his blood samples, said thank you kindly, and went on to the next hive. Along the way I found a blood sample just lying there ready to be harvested so I bent down to gather it up. Wouldn’t have almost filled up my blood meter, but what I didn’t see was the land mine someone placed right by it. I could only watch in horror as the mine exploded and another player stepped over my carcass and gathered up my samples. No one said there were mines, dammit! During each round you’ll hear an incoming air drop which will put two guns into play. One shotgun and one handgun will be made available and it’s a first come, first serve dash to that airdrop. I didn’t survive long enough in the first round to make that far, but in the second round I made it far enough to watch the fight unfold over those weapons. One player made a dash for the shotgun, only to be blown up with a well timed grenade, while the next player picked up the shotty, only to be barbecued by a molotov. I just slinked back into the weeds, and hoped I could get enough samples, and make it to the chopper without having to look down the barrel of that shotgun. Once a player has filled up their blood meter, an extraction timer starts counting down from 30 seconds and the match can play out in one of two ways. If the player with a full meter can get to the chopper without anyone else in the landing zone, and the timer runs out, that player escapes and wins the match. If any other player enters the LZ, the match becomes a last-man-standing game and the player with the full meter must kill all other players. You can only board the chopper if your blood meter is full, but if the chopper is inbound then someone has enough samples to board, and theoretically you could kill them and take their samples. Nice theory, and it sounds good on paper, but then there’s that damn shotgun. Each round played out in about 15 minutes, depending on what tactics the players employed. 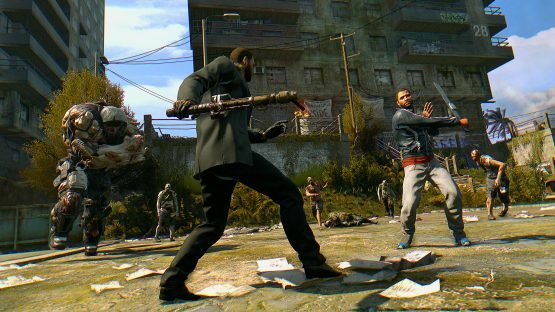 You could ally yourself with other players, working together to take down the big zombies and watching each others backs, but eventually you’ll have to face off, since only one of you can win, so then should you save a grenade or a molotov just for them, or do you take turns winning rounds and decide ahead of time who wins next? Allies can only be allies for so long, and really, are they ever your ally? This is like The Hunger Games but with zombies involved. Sadly I lost both rounds but had a bunch of fun dying. Watching the fight over the guns playout was entertaining, but for me, I would have preferred that we all had to stick to melee weapons, and keep the playing field somewhat level. I was playing with the developers, so the playing field was slightly skewed to begin with. I still had fun and can’t wait for this mode to make it into the wild.